Rain on Beale Street Music Festival? That seems to be the hot question right now! "I have tickets to Music Fest. Is it gonna rain?" There are two answers to this question: 1) "It's Music Fest. When have you ever known it NOT to rain!" and 2) "There's a 50/50 chance." Nobody seems to like either answer, but unfortunately, they may both be correct! This week has been one of those that gives a Memphis meteorologist a headache that doesn't seem to go away. I started off the week with some chance of rain in the forecast every day. Each day I have added another day to the end of the forecast cycle and I have yet to predict a dry day through the middle of next week. As you can tell, this does not mean everyone gets rain and it doesn't mean a washout by any stretch. This time of year has its challenges with high pressure over the southeast U.S. battling cold fronts that make a run at us from the northwest. Sometimes the fronts come through, many times they stall. Where they stall always contributes to these never-ending migraines! This week, a front has stalled out just to our north thanks to fairly strong high pressure to our east. Because it was a little farther north than originally expected, the rain chances didn't really materialize in the metro area early in the week, though Flash Flood Warnings have been out at times for northeast AR. By mid-week, we got into a more diurnal (daytime-driven) shower and thunderstorm pattern with some folks getting brief deluges and others getting nothing. As we head into the latter part of the week and weekend, that front retreats north and we are left trying to time upper-level impulses and determine their effect on our sensible weather in a warm, humid environment. So to answer the original question, I think that old shoes are a must for Music Fest, because I think the ground could be wet from rain we will likely get in the next 24 hours. Am I that confident in rain on the festivities? Not so much. Scattered showers and thunderstorms will be the rule as another front seeps into the area for the weekend, so it could be a downpour one minute and partly sunny the next. Some storms could be strong, particularly during the warmest part of the day, with gusty wind. What it will be is warm (probably 80s before dark and 70s after) and sticky, with a noticeable breeze. So go enjoy Music Fest and maybe take a small umbrella (oversized not allowed). I've never known a little rain to stop any of you fest-goer's anyway! For more info on the Beale Street Music Fest, go to MemphisinMay.org - and to keep up with my forecast, visit the MWN forecast, or go to the PDA version (http://www.memphisweather.net/pdaforecast.html) if you're on the banks of the mighty Mississippi! After a stretch of lower to mid 80s for 5 days in a row, we'll get one more today, but the weather pattern will begin to change as we say goodbye to abundant sunshine, gusty wind, and very warm temperatures, and spring showers and thunderstorms take over. It could turn out to be a pretty wet week as the MWN forecast carries some chance of rain and/or thunderstorms every day through next Monday! Tonight, a frontal system will finally wedge its way into the high pressure that has dominated the region the past several days. We'll be close enough this afternoon to see a low chance of t'storms, a few of which could be strong. The wind will continue to blow as well with gusts of 25-30 mph today. Tonight, that front moves just to our north and stalls out, so look for much higher rain chances, with thunder possible, overnight and into Tuesday and Wednesday. The clouds and precipitation will hold temps down in the 70s Tuesday and Wednesday, though overnight lows will continue to be mild. The front pulls back to the north Thursday as a warm front, but a chance of thunderstorms still exists. Computer models diverge heading into the weekend as the front moves back towards the area. The most likely scenario at this time seems to be the front moving slowly through Friday and Saturday (more rain). Models also hint at precip Sunday and Monday. Fortunately, there are no signs of very cool air approaching, so temperatures should remain springlike throughout. There you have it - rain chances every day! We certainly won't be inundated with rain every day in the Memphis area, but I also am not confident enough to keep rain OUT of the forecast any of these days. Hopefully the latter part of the week becomes clearer in the next 48 hours or so. Keep the umbrella handy this week and stay with MemphisWeather.net for the latest on the changing weather conditions! I think we can officialy say spring is here, and summer is probably not too far away, given the temps recorded around the area yesterday! My blog poll last week asked when the first 85 degree temperature would be recorded. A whopping ZERO of you voted for "prior to April 25"! Well, you were all wrong -and so was I! The official high on Thursday (April 23) was 85, with many stations in the Mid-South surpassing that (see below), including here at WXLIVE! where the high hit 87! The normal high of 74 was surpassed by mid-morning (even with a few stray showers passing through) and while a record was not broken, it definitely was very warm. How warm will it be as we head into the weekend? Check out the MWN Forecast, but I can give you a hint - we may not be done with mid 80s yet! SOME STATIONS CONTAIN ESTIMATED DATA. This movie is a time-lapse of a gust frontal passage I videoed on July 10, 2008 from my home in Bartlett, TN. You'll have to pardon some of the movement at ground level - keep your eyes on the front as it moves from northwest to southeast, passing overhead at about 5pm. My original post on this event, with still shots, can be found here. Gust fronts are basically just outflows from thunderstorms. Air rushing down out of a thunderstorm encounters the ground and spreads out in all directions (typically). The leading edge of that rush of air is termed the "thunderstorm outflow" or "gust front." Strong gust fronts, with a significant wind shift trailing them, can frequently look very ominous. The time-lapse, showing about 9 minutes of video in 30 seconds, was very professionally done by my good friend ANDe, owner of Gemini Media Transfer Service in Bartlett. Check out Gemini MTS (click here for Gemini MTS on Facebook) if you want to get those old home movies or slides converted to DVD or have some professional-quality video editing done! The Mid-South will be transitioning between weather pattern in the upper levels this week that will definitely be noticed down here on the ground as well! Coming out of a stormy pattern over the weekend, when nearly 2" of rain was recorded at WXLIVE!, the next 36 hours will be dominated by an upper level trough (or low pressure) leading to some clouds and cooler temps. In fact, an impulse in this trough will swing through this evening bringing with it an isolated shower or two, more likely northeast of the metro region. Any passing shower will be brief. Tomorrow will see highs in the 60s area-wide with a gusty northwest wind and partly cloudy skies. As we head into the middle of the week, the upper level trough will be replaced by building high pressure (the pattern shift). This will manifest itself as warming temperatures (quite warm by the weekend in fact) and fair weather with some afternoon puffy cumulus clouds as moisture and humidity increase later in the week into the weekend. Look for temperatures to be much warmer - 80s for highs beginning Thursday and lasting through the weekend. No major storm systems look to affect our weather through early next week. The movie loop above shows this transition, as the brighter colors (impulses in the upper atmosphere) move out and then stay north of us, and we're left with the ridge of high pressure dominating the south-central and southeast U.S.
Last week's blog poll asked readers when they expect Memphis to reach a high of 85 degrees the first time? Half of the votes came in "between April 26-May 5" and half were after May 5. Given the current regime, I'd say there's a decent chance the earlier votes could be correct! The MemphisWeather.net forecast will keep you updated on how the pattern shift will affect you this week. AT 403 PM CDT SPOTTERS REPORTED FUNNEL CLOUDS 4 MILES NORTH OF MILLINGTON...MOVING NORTHEAST AT 30 MPH. THESE FUNNEL CLOUDS ARE NOT EXPECTED TO TOUCH DOWN. HOWEVER IF THEY DO TOUCH DOWN...WINDS ARE EXPECTED TO BE 50 MPH OR LESS. THE NATIONAL WEATHER SERVICE IN MEMPHIS IS MONITORING THE SITUATION CLOSELY. IF FUNNEL CLOUDS TOUCH DOWN OR IF A TORNADO WARNING IS ISSUED IN YOUR AREA...THEN SEEK SHELTER IMMEDIATELY. The Mid-South is once again under a SLIGHT RISK of severe weather for this afternoon and early this evening and Severe Thunderstorm Watches are in effect until 7pm for eastern Arkansas and 8pm for west Tennessee and north Mississippi. At 2:25pm on MWN StormView Radar, a line of strong to marginally severe thunderstorms extends south through north Mississippi roughly along I-55 from DeSoto County south about 75 miles. Another batch of showers and embedded thunderstorms is located over east AR from west of Jonesboro to east of Stuttgart. All cells are moving east at about 35 mph and further development is likely as the afternoon progresses. All of these storms are firing up in response to some clearing of the clouds behind this morning's rain, but still ahead of a cold front that will move through this evening. The clouds breaking apart allow additional surface-based heating to occur, which destabilizes the atmosphere. The cold front serves as the lifting mechanism to cause the storms to form in the buoyant air. Once the front passes, the severe weather threat will end. The main threat with these storms will be the potential for large hail, though a damaging wind gust is possible as well. The tornado threat is very low with these storms. Stay with MemphisWeather.net for the latest on this potential severe weather threat. While Tornado Alley has always been the hot spot for tornado occurrence in the United States, a lesser-known alley - "Dixie Alley" - produces the most killer tornadoes. As reported last month by the State Gazette out of Dyersburg, TN, Dixie Alley has about the same number of strong and violent tornadoes, but more killer tornadoes than it's more more widely-known cousin. 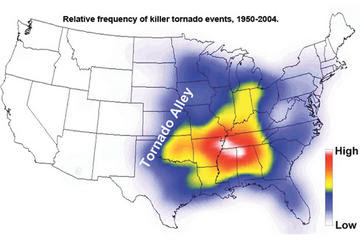 The graphic above highlights the frequency of killer tornadoes that occur in the Mid-South. Dixie Alley encompasses the Mid-South and includes AR, west and middle TN, LA, MS, AL, and most of GA. The reason for the higher propensity of deadly tornadoes can likely be attributed to several factors. These include the frequency of nighttime events, a higher percentage of mobile homes, hilly and forested terrain that makes it harder to visually spot tornadoes, and a longer severe weather season that may lower residents guard. Tornado Alley tends to have a shorter severe weather season, flat terrain that allows storms to be seen miles away, and lower population density. An excellent presentation comparing the two regions was made by NWS forecasters, led by Alan Gerard. All of this points to the need for Mid-Southerners to be keenly aware of impending severe weather threats and be familiar with what they would do if severe weather, particuarly tornadoes, occur. They can occur at any time, in any month (with a pronounced "season" from November through May). The National Weather Service has done a phenomenal job of improving warning lead times and accuracy in their warning process. It's now up to you to heed the warnings and always know the plan of action, wherever you may be. Last year's Super Tuesday tornadoes and the Good Friday tornadoes in middle TN last week are proof that "it doesn't happen here" is simply false. For more information on tornado preparedness, check out this NWS Tornado Publication (PDF) and website or download and print the MWN Severe Weather Safety Tips (PDF). Also, every family should own, maintain, and keep turned on, a NOAA Weather Radio - it could be what saves your life in the middle of the night! Final results from the National Weather Service storm survey of the Murfreesboro tornado that occurred on Good Friday, April 10, 2009, are in. The survey indicates that the total path length was actually 23.25 miles, after the NWS discovered another 8 miles of damage on their survey Sunday. Also, the maximum intensity has been increased to an estimated 170 mph (or EF-4 on the 1-5 scale) in one section of the damage path! The maximum funnel width was 1/2 mile and there were numerous signs of multiple vortices with this storm, which becomes more common with tornadoes of this strength. The NWS survey results can be found here. The latest compilation of photos (such as the one above which was submitted to the paper) from readers of the Daily News Journal out of Rutherford County can be found here. My previous posts on the subject can be found here (April 10) and here (April 11). To find a way to help those in need from this storm, visit http://www.midtnredcross.org/. Our thoughts and prayers are with the victims families and all of those affected. The NWS has conducted an initial aerial and ground survey and will be back on the ground Easter Sunday conducting additional surveys. Preliminary indications are that the Murfreesboro Good Friday tornado was at least an EF-3 with 150 mph winds, a path length of 15 miles over 22 minutes, and it was up to 1/2 mile wide at one point near I-24. There were also indications on amateur video and on the ground that the tornado could have had multiple vortices. The NWS survey results, including photos, can be found here. 12-15 homes were destroyed, dozens more had significant damage, the upper level of a 2-story office complex was removed, tractor trailers were laid on their sides, some homes were moved off their foundation, and trees were de-barked. The NWS indicates it is possible that the damage was greater than EF-3 once their survey is complete. My original post, including amateur video and links can be found here. 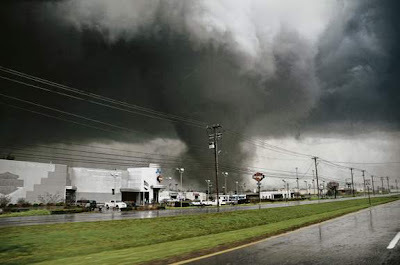 Reports from Emergency Management officials and the AP are that 2 people are dead (a female in her mid-20s and her 9-week-old daughter), 35 were injured, and over 3 dozen homes were destroyed from an apparent tornado that struck Murfreesboro during the lunch hour on April 10. Below are two amateur videos as the storm moved through the Walter Hill area of Murfreesboro. Click here for the story from Daily News Journal out of Rutherford County and here or here or here for photos from the area. All photos courtesy DNJ.com. Storm reports are scattered across the entire mid-state as a line of supercell storms moved across the region during the late morning through mid-afternoon hours. NWS officials from Nashville will do a storm survey today (Saturday) to determine the magnitude of this event. I'll post their findings once they are published. The Pyramid/Bluff Effect.. or just another weather coincidence? In an article written today by AP Science Writer Seth Borenstein (full article), President Barack Obama's chief science advisor, John Holdren, claims that global warming is "happening so fast" that measures once dismissed as radical need to be discussed and considered. While Holdren states that using such experimental measures would be a "last resort," he feels it prudent enough to entertain the discussion - and apparently the White House agrees. Discussions are apparently ongoing with Cabinet level officials and others such as the EPA and NASA. Holdren states, "We don't have the luxury ... of ruling any approach off the table." His take is that if nations do not act fast enough to slow global warming, "really intolerable consequences" could result, including the loss of summer sea ice in the Arctic (presumably as early as 2015), disastrous drought conditions, food shortages, rising sea level, and more powerful coastal storms. The American Meteorological Society drafted it's own policy statement in March, still under review, which in effect states that it is prudent to consider the potential of geoengineering, to "understand its limits and to avoid rash deployment." It suggests that there should be a full and complete examination of all possible consequences, both expected and unexpected, prior to proceeding. My take: While an increase in greenhouse gases, particularly CO2 and other particulate matter, is an issue that should be dealt with on a global scale, there is little support among climatologists who are not funded by politically-driven entities or organizations that global warming is either A) as dire as made out to be by the popular press, or B) not driven MUCH more significantly by natural and/or astronomical processes, with a slight (though likely quantifiable) anthropogenic (or human-induced) effect. It is indeed prudent to consider and implement methods to "reduce our carbon footprint" and "go green," as pop culture has espoused. However, to follow this path simply because of an unhealthy level of fear, guilt, or alarmism, created by those who report the "facts" based on a political or ideological agenda, is foolish. A POTENT LOW PRESSURE SYSTEM WILL MOVE ACROSS THE MIDDLE MISSISSIPPI VALLEY AND ALLOW FOR SCATTERED SEVERE THUNDERSTORMS TO OCCUR ACROSS THE AREA TONIGHT THROUGH EARLY FRIDAY. THE MAIN HAZARD WITH ANY SEVERE THUNDERSTORM WILL BE LARGE HAIL UP TO THE SIZE OF GOLF BALLS. DAMAGING WINDS IN EXCESS OF 60 MPH AND TORNADOES MAY BE POSSIBLE AS WELL. AREAS NORTH OF THE MEMPHIS METRO AREA, INCLUDING JONESBORO, DYERSBURG, AND JACKSON, HAVE THE HIGHEST CHANCE FOR SEVERE WEATHER TONIGHT INTO EARLY AFTERNOON FRIDAY. A SLIGHT RISK FOR SEVERE THUNDERSTORMS IS IN EFFECT FOR THE ENTIRE AREA INCLUDING THE MEMPHIS METROPOLITAN AREA. THE BEST TIME FRAME FOR SEVERE THUNDERSTORMS WILL BE BETWEEN 9PM CDT TONIGHT AND 4AM CDT FRIDAY, THOUGH ADDITIONAL STRONG STORMS COULD OCCUR ALONG THE COLD FRONT WHICH WILL MOVE THROUGH DURING THE MID-MORNING HOURS ON FRIDAY. WHILE THE POSSIBILITY OF SEVERE WEATHER EXISTS DURING THE NIGHTTIME AND EARLY MORNING HOURS, CHANCES OF A SEVERE WEATHER OUTBREAK (WIDESPREAD SEVERE WEATHER) REMAIN LOW AT THIS TIME. ALL RESIDENTS OF THE MEMPHIS METRO AREA ARE ENCOURAGED TO BE ALERT FOR STATEMENTS, WATCHES, AND WARNINGS TONIGHT THROUGH EARLY FRIDAY. STAY TUNED TO NOAA WEATHER RADIO, MEMPHISWEATHER.NET, AND/OR LOCAL MEDIA FOR THE LATEST ON THIS POTENTIAL SEVERE WEATHER SCENARIO. The earliest quantitative rain gauge seems to be credited to a king in Korea called King Sejong who lived from 1397 to 1450. One of his greatest goals as king was to make his people literate, so not only did he invent a rain gauge, but more importantly, he invented a language and movable type for that language. He decided that instead of digging into the soil to check for moisture, it would be better to have a standardized container about 30cm in depth and 14cm in diameter that stood on a pillar to measure the rainfall. His standard of measurement however is not known. These containers were to help villagers determine their potential harvest, to give him a better idea of how much the farmers should be taxed. So these standard containers were distributed to each village. The gauge was invented in the fourth month of 1441 according to records. The invention of the rain gauge in Korea came two hundred years before inventor Christopher Wren created a rain gauge (tipping bucket rain gauge circa 1662) in Europe. Though it's a little late, here are the climate stats for March 2009, which ended up slightly warmer and wetter than average. At the official recording station for Memphis, the average temperature was 55.1 degrees, which was 1.6 degrees above normal. The highest temp for the month was 80 degrees on the 9th and the lowest was 24 on the 2nd. Precipitation totaled 6.12", which is a little more than a half-inch above normal. There were 3 days it dropped to or below freezing, which is 2 below average. The airport recorded 0.3" of snow on 3/1 (the tail end of the 2/28/09 snow storm), which concludes the 2008-2009 season at 4.1" (2.5" below average). There was also a trace recorded on both the 11th and 12th as well. (It should be noted that there was 3" of snow on the ground on the morning of 3/1). The peak wind gust was 40 mph on 3/5. Click here for the NWS recap. In Bartlett, WXLIVE! recorded an average temperature was 53.9 degrees, with a max of 81.4 on the 9th and a min of 18.6 degrees on the 2nd. Precipitation totaled 5.27", though some of the recorded precipitation on 3/1 of 0.62" was snow that fell on the 28th and was recorded on the 1st. The peak wind gust was 33 mph on 3/5. The MWN Forecast accuracy statistics are finalized as well. For the month of March, the MWN forecast beat out the computer models and the NWS forecast in the temperature and dewpoint categories. Average MWN temperature error for March was 2.73 degrees, followed by the NAM model at 2.78 degrees, the NWS at 2.88 degrees, and the GFS model at 3.18 degrees. Dewpoint error averages were similar, running about one degree higher across the board. Thanks to everyone who counts on "the most accurate public forecast for Memphis" on a daily basis! Freezing temps failed to materialize this morning across most of the Mid-South (not that we're complaining!) thanks to a steady wind of about 10 mph and cloud cover that hung in most of the night. Lows were all pretty much in the mid 30s and no records were broken. The Weather Service maintains a Freeze Warning tonight for much of west TN east of a line from Dyersburg to Somerville, as well as northeast MS, including Tupelo. The metro area will remain above freezing as south wind blows at 5-8 mph. Some outlying areas, particularly north and east of the city, could see some patchy frost if the wind dies down more than forecast. Overnight lows will be in the upper 30s in the city and mid 30s in typically colder locations. I expect this will be the last gasp of winter and spring will finally take hold for good! The warm-up really takes shape tomorrow as we reach 70 for a high and stay near that level through the upcoming Easter weekend. A storm system will bring a small chance of severe weather late Thursday afternoon through the night with dry conditions expected Friday and Saturday. Saturday will be the best day of the weekend with sunny skies and highs in the 70s. For Easter Sunday, sunrise services and morning activities should be OK, but by afternoon another strong frontal system approaches and showers and thunderstorms become likely. Plan your outdoor activities early in the day! Thanks to a potent cold front, clouds hanging in all day today to keep it cold and clearing late tonight, plus decreasing wind tonight, it looks like we could be set up for near-record low temperatures by morning. This is 3 years in a row we've had an April cold snap, last year being producing similar temperatures on April 14-15 (see 2008 climate data) and 2007 setting the record for tomorrow's date (April 7) and the 8th (see 2007 climate data) when it got a few degrees colder than the current forecast. Tomorrow's record low is 30 degrees set in 2007. The coldest high temperature for this date is 41, which we have eclipsed by just a few degrees. Look for near freezing in the city center tonight, but for everyone else, upper 20s are in order and precautions will need to be taken. That is the reason for the FREEZE WARNING for the entire region tonight from midnight to 9am. Fortunately, the Memphis metro area is staying out of today's precipitation, but not too far east of here, in middle TN and farther north, snow is falling! Looking ahead, tomorrow will be a little warmer than today (50s) thanks to more sun, another cool night is expected Tuesday night, with patchy frost in the suburbs, then the warm-up begins in earnest on Wednesday ahead of the next rain-maker on Thursday. A strong late winter cold front, followed by high pressure of Canadian origin, is zeroing in on the Mid-South and will pass through the region this afternoon. A few showers and an isolated thunderstorm will occur along the front, though rain chances are pretty low for the Memphis area. Behind the front, wind will shift to the west and become gusty (30-35 mph gusts) and temps will plummet overnight, from highs near 70 today to the 30s at most locations tonight. With the wind staying up in the 15-20 mph range, the threat of frost is very low tonight, but wind chills will fall to near or below 30 degrees. Clouds wrapping around the low pressure system associated with the front and the push of very cold air could result in sprinkles or perhaps even snow flurries (mainly north of the city) overnight tonight or tomorrow. Monday's highs will be some 25 degrees colder than today, so bundle up as wind will continue to make it feel very cold!! For Monday night, that wind dies down and the clouds may even depart after midnight, leading to decent radiational cooling conditions, which means very cold temps. A Freeze Watch is in effect for the city and surrounding areas from midnight to 9am Tuesday as temps bottom out near 30 in the city and into the 26-29 degree range in the suburbs. 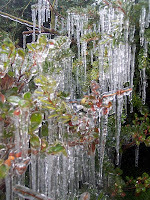 This hard freeze will kill young plants and outdoor vegetation if not properly taken care of. If you have flowering bushes or other exposed plants with tender leaves that are not very close to the ground, you'll want to cover them up or bring them inside if possible. Tuesday will be a little warmer, but still well below normal with highs in the lower 50s. Another cold morning, with a frost definitely possible in the suburbs, will occur Wednesday before south wind helps temperatures quickly rebound during the day into the upper 60s. The MWN Forecast will be updated to let you know just how LOW it will go! Poll results: How do you get your weather warnings? With the internet dominating all mediums for information gathering, it is not surprising that the majority of respondents turn to that source as it is generally reliable and timely. The NWS issues warnings in a method that provides easy parsing, display, and distribution via the internet. MemphisWeather.net takes advantage of this with the severe weather warning map and e-mail notification service - both of which performed admirably during yesterday's severe weather events. TV continued to do well as people have become used to checking their favorite affiliate for wall-to-wall coverage during severe weather. The only disappointment in my book is the use of NOAA Weather Radio, which should be much more widely used as it can alert the user to severe weather that occurs any time, and for only the county(ies) programmed. Weather Radios save lives and until an internet site can wake you up in the middle of the night, NOAA Weather Radios should have a place in every home. UPDATE: NWS-Nashville confirms the tornado was an EF-1 with 90-100 mph wind and a path length of 2 miles. Click here for a report from NWS-Nashville, including damage map and photos. Reports are coming in of structural damage in the Nashville area after a severe thunderstorm and possible tornado hit eastern Nashville/Davidson County around 4:00pm. The Nashville NWS office reports major damage to an office complex roof and 20-30 cars on Murfreesboro Road, 2 overturned semi-trucks at I-40 and Briley Parkway near the airport, numerous large trees down in the Donelson area, and flooding in Centennial Park. In addition, the severe weather forced Nashville International Airport's Air Traffic Control (ATC) Tower to be evacuated, causing the airport to close for a period of time. Passengers in the terminals were directed away from windows as the storm rolled through. Here are some photos of damage from the Tennesseean and Friday's article from the Tennessean. A Google map shows the area affected, with the airport bounded by Donelson Pike, Murfreesboro Pike, Briley Parkway, and I-40. The Storm Prediction Center continues to keep an eye on our area as thunderstorms move into the region near the strong low pressure center. Some storms are producing small hail and high wind. A watch box may be issued yet this evening for the Memphis area for this threat, as well as an extremely isolated tornado. Storms will last a couple of hours before moving out of the area by 9-10pm, ending our precipitation chances for today. 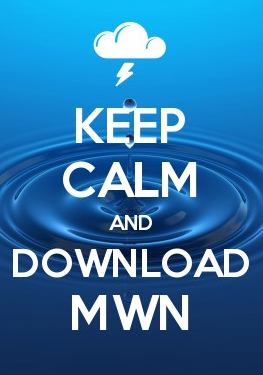 Stay with MWN for the latest. As a side note, Nashville was under a Tornado Warning late this afternoon and there are some reports of damage around the airport area, as well as a couple of trucks blown over on I-40 and sporadic flooding. Tornado Watch #106 has been lifted for most of the metro area except Fayette and Marshall counties and that will expire at 3pm. The first batch of storms is pretty much through with rain tapering off behind it. We now look back to the west, closer to the strong low pressure center, where scattered storms are firing over southwest AR from about Hot Springs to El Dorado. These storms are intensifying and wrapping around the low located near Texarkana at this hour and moving in our direction. I expect we will see another round of scattered strong storms as it moves through during the rush hour time frame into the early evening. Some of these storms could produce large hail or damaging wind, with an isolated tornado threat. Tornado Watch #106 has been issued for all of north Mississippi and the southern tier of counties in west Tennessee (including Shelby and Fayette) until 3pm. Thunderstorms have moved into the area, some of which could be severe. A few could produce isolated tornadoes as they move rapidly northeast out of MS into west TN. All Mid-South residents should be weather aware today and stay abreast of changing conditions, including the issuance of any warnings. The links below to MemphisWeather.net products will keep you on top of any severe weather that threatens the area. The Memphis metro area continues to be just on the edge of a MODERATE RISK of severe weather for today with the main threat being damaging wind and large hail. An attendant threat of tornadoes also exists, primarily over northern Mississippi. The timing of the severe weather threat is from the lunch hour through about 7pm. Several ingredients still need to come together for this event to play out as forecast. See the graphics above for the risk area as well as the risk of tornadoes. The hatched light blue area in the second graphic highlights where there is a 10%+ chance of a strong (EF2-EF5) tornado occurring within 25 miles of any point. The Storm Prediction Center has issued a Public Severe Weather Outlook - issued only when an outbreak of severe weather is a strong possibility. Read the text of that outlook here. All Mid-Southerners should pay close attention to the possibility of severe weather today and prepare to take action should it become necessary. 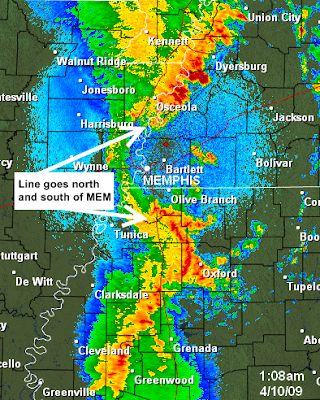 MemphisWeather.net will continue to provide the latest on this developing severe weather scenario. Click here for the severe weather awareness page from the NWS. The spring pattern has definitely set in and the Mid-South is once again under the gun for potential severe weather. While things didn't pan out as expected last Friday due to a fairly complicated system that the models had a difficult time forecasting, this one brings some of the same uncertainty. Once again, the potential definitely exists though, and I think our chances for strong storms are higher this time around. Above are the graphics from the Storm Prediction Center showing the metro area is again on the edge of a MODERATE RISK forecast. The probability outlook (second image) indicates a 45% chance of severe weather within 25 miles of any one point, while the hatches area indicates a 10% or better chance of significant severe weather within 25 miles of any point. The scenario is once again for a low pressure system to cross very near the metro area, with a possible track near the I-40 corridor. As the low and it's attendant cold front approach tomorrow afternoon, we will have one thing on the side of severe weather that we didn't have Friday night and that's better timing - during the warmest part of the day. The most likely type of severe weather will be a squall line, or mesoscale convective system (MCS), along the cold front producing high wind and large hail. Supercells could be embedded within this line and those could produce larger hail and possible tornadoes. The best guess at timing for this event right now would be between 1:00-7:00pm. A couple of quiet days are expected after this event before yet another system containing thunderstorms moves in Sunday. 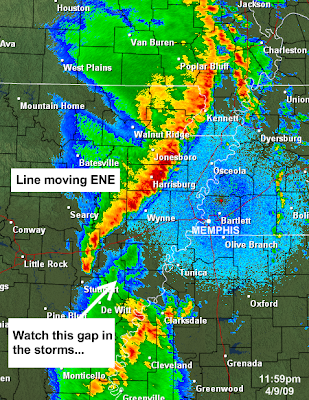 More on this one once we get past tomorrow... Stay with MemphisWeather.net and this blog for the latest.